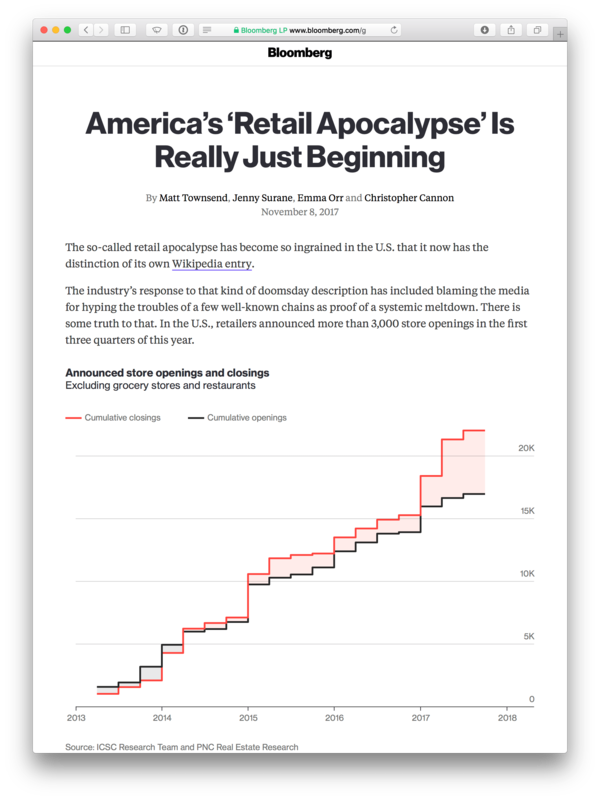 Retail apocalypse has become so common speak that it now has its own Wikipedia entry. According to Credit Suisse Group AG analyst Christian Buss there were more store closings in 2017 than the 2008 peak. Resulting in newspaper headlines like “America’s Retailers Are Closing Stores Faster Than Ever”. “The term retail apocalypse refers to the closing of a large number of North American brick-and-mortar retail stores starting in the 2010s and continuing through 2018. Over 12,000 physical stores are affected from over-expansion of malls, rising rents, bankruptcies of leveraged buyouts, quarterly profits beyond holiday binge spending, competition, delayed effects of the Great Recession, and changes in spending habits. North American consumers have shifted their purchasing habits due to various factors, including experience-spending versus material goods or better homes, casual fashion in relaxed dress codes, as well as the rise of e-commerce and competition of companies such as Amazon.com and Walmart, which closed stores in prior years. The death of retail is never going to materialize, but the struggles brick-and-mortar stores are facing now are going to change it. This is not caused by Amazon - the often quoted villain of retail - but instead by over-expansion and debt. The retail apocalypse will continue to bring closures for years to come, yet it will make the surviving retailers better. There is a relationship between how consumers shop and what they buy, and the channel they use. People do not shop the same on Amazon as in retail shops. And so people do not buy exactly the same things on Amazon as they do elsewhere. The changing retail is thus going to change what people buy. Brands spend hundreds of billions of dollars every year on marketing, shelf space priority, partnerships, and packaging to build reputation with consumers which allows them to command a premium price. For example, Procter & Gamble spends more than $2 billion every quarter on advertising and marketing. In 2017 they spent $7.1 billion in advertising alone to generate $65 billion in sales. But it wasn’t Procter & Gamble who spent it - it was consumers. Keeping that in mind, add in the fact that most shopping searches online start on Amazon, they command close to half of all US e-commerce, and more than half of US e-commerce growth. Since most shopping in the US is search-based, as opposed to through recommendations, many assets brands built offline do not translate well into shopping online. On Amazon this means brands which play the Amazon game better do better. Being the number one result in search results is more valuable than the recognition created by paying for premium shelf space. This realization is why the growth of Amazon-native brands, micro brands native to the Amazon platform, is so apparent on the platform. Brands are a shorthand consumers use for guidance toward the right product. But on Amazon the search technology and customer-submitted reviews are the shorthand. “Your margin is my opportunity” is the famous Jeff Bezos, CEO of Amazon, quote. It can be argued that Amazon sees the premium pricing charged by brands as an opportunity to give it back to consumers by eroding what it means to be a brand on their website. Many things P&G had to spend on create no value to consumers, but are required to push the products to them. This is why brand apocalypse is going to come next. It is not going to be as visible as the retail apocalypse, but over the next decade the landscape of brands will change. Caused by changing purchasing habits, and the continued growth of e-commerce. For the same reason some retailers are struggling, some brands will struggle too - things are changing. In the end it will be an apocalypse because too many will miss the early signs. But just like the retail apocalypse can’t be blamed on Amazon alone, the changes to brands are not happening on Amazon only either. Direct-to-consumer is creating new types of relationships, digital-native brands have been successful for a few years, micro brands on social media are starting to flourish, and many more unique ways are yet to come. The different channels combined with their unique affordances is an opportunity for different types of brands. Traditional brands are at a bit of a disadvantage online because the things they invested into are not as obvious and as valuable online. For example, great packaging. One of the reasons why Amazon Basics batteries are outselling Duracell and Energizer is because they have packaging optimized for convenience, not for store display. Brands is young concept, less than a hundred years old. The notion of brands having superior value to its competitors and identity brands came barely fifty years ago. The question is what is going to be the next shift, what is going to allow to differentiate in the retail market dominated by search-first marketplaces. “Winning” brands understand the consumer best and develop the right mix of a logo, pricing, packaging, advertising, promotions, etc. Well, the consumer changed and caused retailers to struggle. The winning mix for brands will have to evolve too.